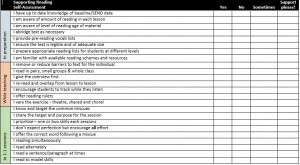 Simple pupil passport Click the link to download a simple Pupil Passport designed to reflect a consultative process including the student and parents/carers. 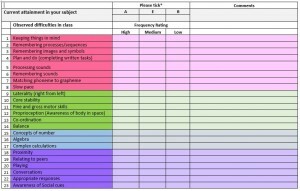 SEN IR checklist Click the link (not the image) to download. This is a check list to have at hand when compiling your SEN Information Report. For full details of what is needed you can go to P95 and 96 of the new COP. This is a tool to help teachers reflect upon the way they support struggling readers. Again its a Word document and can be amended to suit your purpose. Feedback appreciated. 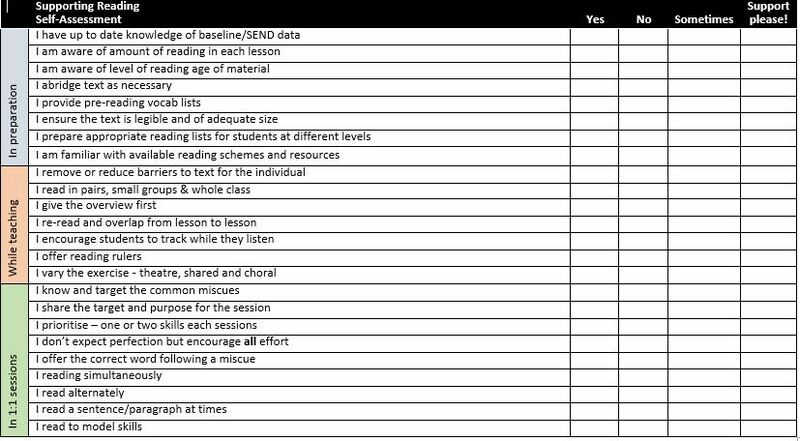 This tool is fully explained in my new book ‘Effective Differentiation for Teachers’, it’s designed to help practitioners collect specific feedback about a child’s learning behaviour. There are a whole host of ways to use it to inform practice. The colours broadly comprise the barriers to learning associated with a variety of common specific learning difficulties. It’s in an editable format so that you can change and use as you wish. Do let me know how you get on with it.